Zack Stair, top left, of Gilbertsville, Montgomery County, came to the parade with his son, Nolan, and their friend Drew Carney and his son, Jacob. Moments after the Eagles caravan had passed by him near City Hall, Zack Stair began scooping up the green and white confetti that littered the street, filling his backpack. Stair, of Gilbertsville, had waited 40 years to bask in this moment. But he was thinking of his two young sons, who stayed home in Montgomery County to watch the parade on television. When he gets home later Thursday, he's going to throw the confetti on them in celebration. "It was great," Stair said of the parade of players that rolled by. "You could see the team come through – the team that did it for us. ... They could see how happy it makes us. There's nothing you can do to show them how much we appreciate that." The parade lived up to Stair's expectations. 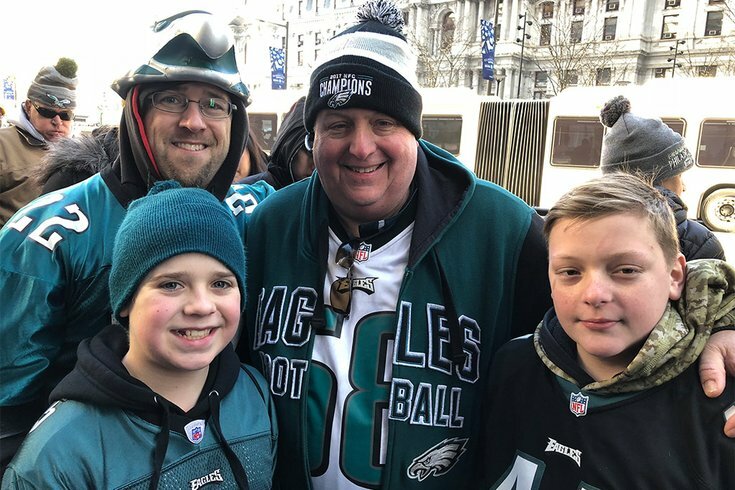 He and his oldest son, Nolan, age 12, arrived in Center City about four hours before the parade reached them – around 12:45 p.m. Their friends, Drew Carney, 55, and Jacob Carney, 12, of Gilbertsville, accompanied them. "I'm 55," Drew Carney said. "I've been waiting since I was (my son's) age or younger. It's just amazing – and it's just the start."